by MarkLives (@marklives) Graham Warsop, founder of The Jupiter Drawing Room & Partners, offers his personal take on the resignation of Sir Martin Sorrell as CEO of WPP, and calls on the agency global holding company to offer transparent feedback on “personal misconduct” allegations levelled against Sorrell. In 2009, WPP acquired a 49% stake in The Jupiter Drawing Room & Partners, which at the time held stakes in The Jupiter Drawing Room (Johannesburg), The Jupiter Drawing Room (Cape Town), Black River FC and MetropolitanRepublic. by Graham Warsop. The day was eventually going to dawn when the indefatigable Sir Martin Sorrell, supreme head of the WPP empire, would no longer be CEO of his ‘baby’ — the largest marketing services company on the planet. Accepted wisdom was that it would most likely be the grim reaper who terminated his employment at WPP. Dying in the saddle seemed like the only truly fitting conclusion to the career of a 73-year-old CEO who, every day for the last 33 years, ate, slept, lived and breathed WPP. No one could have predicted such a hasty resignation, effective immediately, predicated by unspecified allegations of “personal misconduct”. It’s a sad and shocking termination for a man that many (myself included) consider to be the most-remarkable and -visionary entrepreneur in the history of our industry. When entering adland as a junior copywriter at the end of the 1980s, I shared the great David Ogilvy’s disdain for an upstart accountant, “who had never written an ad in his life’” seeking to move to the centre stage of the global advertising industry. How could a creative philistine possibly be allowed to get his grubby hands on the polished jewel that was Ogilvy? We all watched in astonishment as one global network after another fell prey to Sorrell’s ambitions. First JWT, then Ogilvy, Y&R and Grey. All master-minded by this self-confessed bean counter. Shunning huge executive suites, Sorrell and a small talented team operated out of tiny offices in Farm Street, London W1. Over time, it became clear that his master plan extended way beyond the introduction of rigorous financial disciplines to an industry not noted for its business acumen. At a time when agencies were preaching to clients what advertising they should be wanting, Sorrell’s approach was to rather look at what clients needed to gain a competitive advantage. He deliberately branched out into a raft of marketing services that went way beyond traditional advertising, realising that if he didn’t provide them, someday, someone else would. It’s a testament to his vision that today 50% of WPP’s £15bn in revenues hails from the digital arena. For three decades, WPP survived recessions and prospered. In recent years, there were outcries over Sorrell’s pay (his distractors conveniently ignoring the fact that most of it was performance-based remuneration). As a matter of interest, exactly what is the right remuneration for the founder, CEO and standard bearer of a personal-services company, grown from inception to post-tax profits of £2 000 000 000.00 last year? (To put it in context, that’s a post-tax profit of over R34bn!). Sorrell became the undisputed industry oracle. Always present on a stage somewhere, be it Cannes or Davos. Fiercely bright and implacable, with an astonishing capacity to retain facts. His calm and confident utterances about the industry and where it was heading provided a measure of certainty to clients, investors and the industry alike. But in these disruptive times, the model of large advertising-based agency networks has come under severe attack. Not even the diversification strategy and philosophy of ‘horizontality’ could wholly combat the onslaught of consultants, procurement officers and global clients slashing budgets as they struggle to come to terms with the relentless rush of technology. In that climate, the WPP board announced that two legal firms had been retained to investigate an allegation of personal misconduct by Sorrell. He denied the allegations “unreservedly”. But Pandora’s Box had been opened. It come as no surprise that, in the interests of the company he spent such an enormous part of his life nurturing and growing, he should put its interests before his own. Hence his resignation and the close of the most-remarkable chapter in the history of advertising. Many people who know Sorrell by reputation only will not fully appreciate the grasp he had on the empire he created. Having had the privilege of interacting with him for a number of years, my admiration for his unprecedented accomplishments and work ethic is unbounded. I’ve always believed, however unfashionably, in the merits of having a visionary founder associated with an agency brand — a visible leader who believes unreservedly in his brand and its cause, willing to champion his company in good times and bad. Sorrell was just such a leader. In an age in which managers have replaced entrepreneurs, strategies are made by committees and decisions promulgated by faceless boards, he led from the front. His direct communication channel was legendary. As anyone who regularly emails him would know, if a reply from him is not forthcoming within 15 minutes, it’s best to check whether your in-box is malfunctioning. He bravely expanded into new continents and territories (a head count of WPP companies in South Africa providing clear evidence of his commitment to this region). Sorrell as WPP CEO was truly a pioneer, with unrelenting energy harnessed to create a global marketing services empire, unprecedented in its size, its geographical reach, its scope of services and, ultimately, its creativity (the latter proved at Cannes, with WPP winning Holding Company of the Year in every one of the seven years the award has been made). My advice to the chairman of the board of WPP is to be transparent. Clarify exactly what the “personal misconduct” allegations were and the results of the investigations conducted. Let’s not forget, Sorrell has vehemently denied any wrongdoing. Whatever the outcome, it cannot be worse than the current unspecified “personal misconduct” allegations that stand to leave his departure from WPP shrouded in murky conjecture, that will only serve to sully his name, his reputation and his giant legacy. 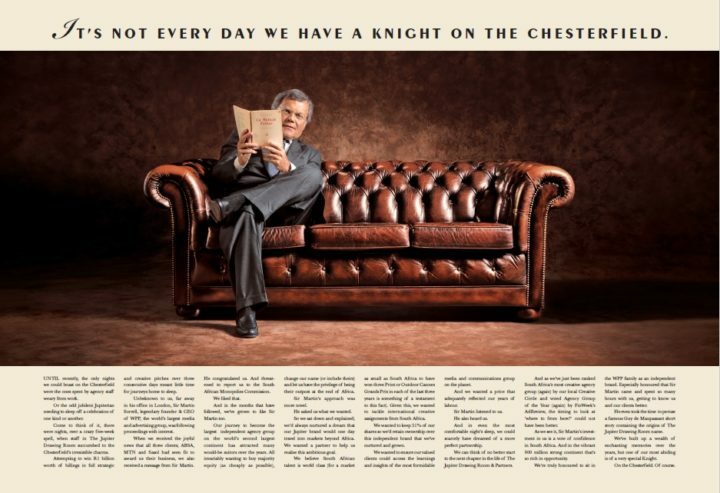 Sir Martin in happier times, featured in The Jupiter Drawing Room’s house ad announcing WPP’s acquisition of 49% of The Jupiter & Partners group. Well said, Graham. Let’s hope the WPP board do the ‘right thing’. From a similar Ogilvy heritage, I shared your initial reservations. Whilst I retain some reservations, Sir Martin did an incredible job. Just not sure he/his board saw the ‘writing on the wall’ early enough and ‘future proofed’ the business, for all stakeholders – most notably clients.